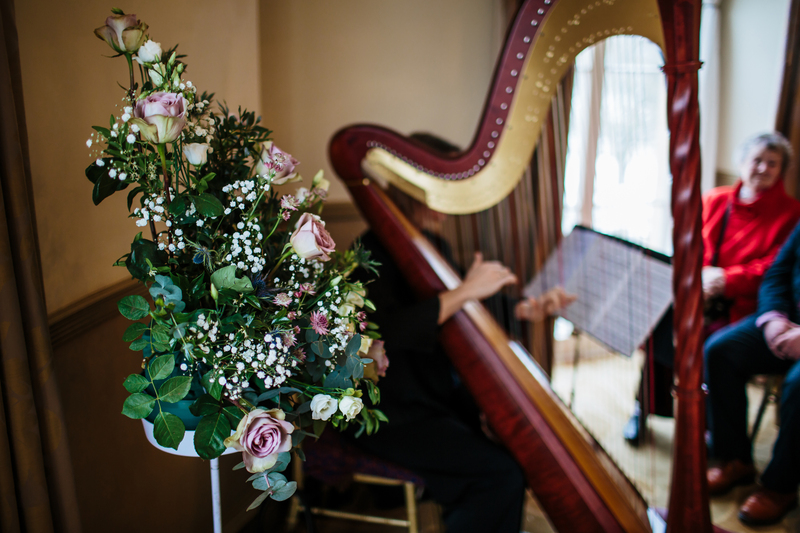 Katja & Paul held their Wedding at The Mansion in March, in a truly wonderful celebration with their friends and family. 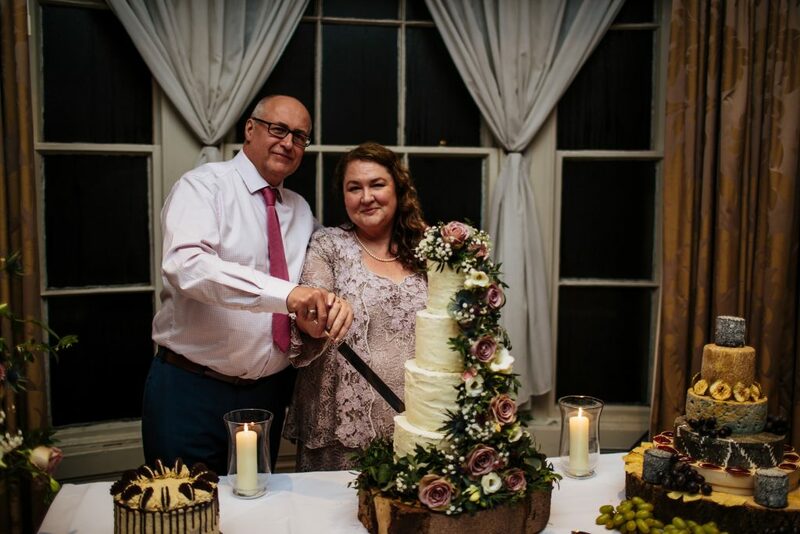 Katja shares all the details of their special day, and how even the ‘Beast from the East’ couldn’t spoil their plans! At the end of the day I told Lewis that he was my hero and that he had made everything that I wanted just happen. So many of my friends and family commented on how hard Lewis and his team worked and that he was like a conductor with his orchestra making everything take place beautifully. The food was fantastic and the service faultless. Katja Anderson (now Ashton), 55 years old, bid manager for a law firm, and Paul Ashton, 56 years old, project manager for an engineering firm. We both live in Fairburn, West Yorks. 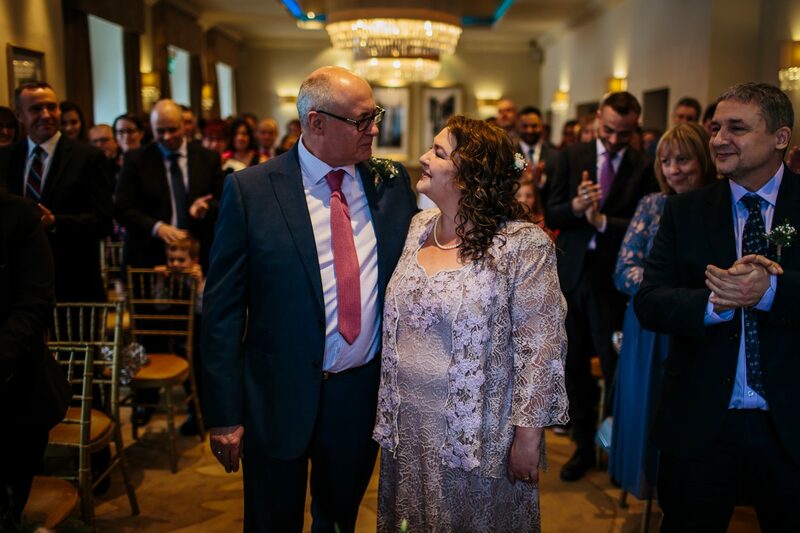 The wedding took place on Saturday 3rd March 2018 – civil ceremony and reception at The Mansion. 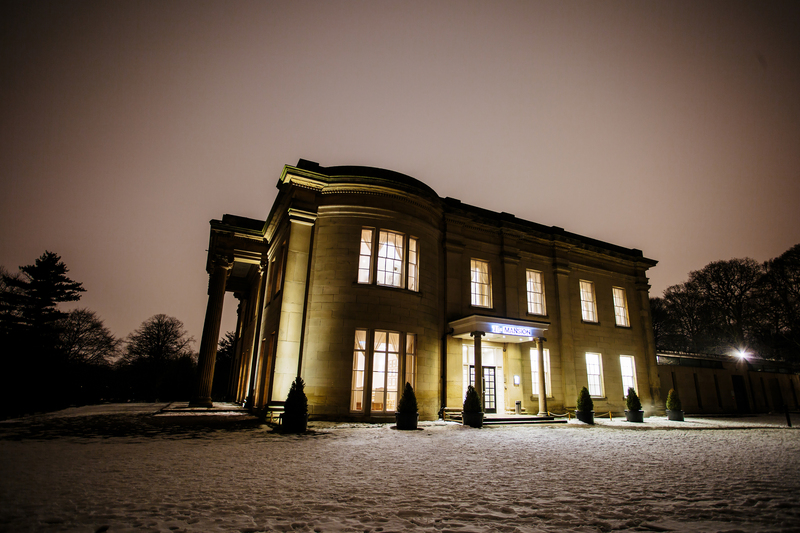 We chose The Mansion because we love Roundhay Park and often come into Leeds to visit my sister (who lives nearby) and walk our Border Collie Harvey in the park. 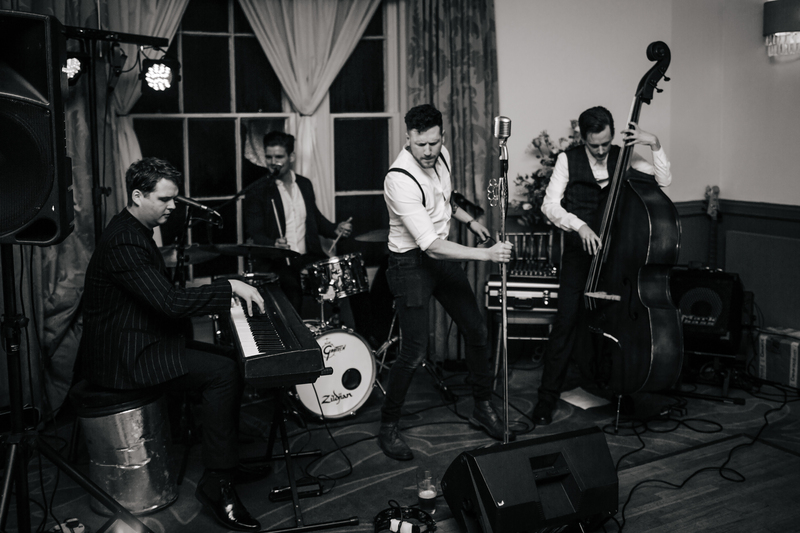 We have always admired the building and it was great to have a venue that did everything – so that people did not have to dash around from place to place. It’s a long story . . . . Most people would not think it was a romantic proposal – but I was not complaining as he knelt down on the kitchen floor when I got in from work one Friday evening. Finally!! The dress – where was it from & what was it like? Being 55 and not what you’d call slim . . . finding a dress was not something I was looking forward to. As the date approached I was not really doing anything about finding one. But I went away on a girly weekend with my daughter Tamsin, my aunt and my cousin to Stratford Upon Avon. We were having a hot chocolate, when my daughter appeared and ordered me to come to a little boutique called “Cordelia” on Sheep Street. She had found a dusky pink and champagne dress and jacket in Italian lace which was just perfect. It is the only dress I tried on! The ceremony – who conducted the ceremony and where did it take place? The ceremony was conducted by a lovely Registrar from Leeds Council. He made it all feel very special and made it fun for the children who attended. The cake – where was it from and what was it like? Well, let’s face it – it’s all about the cake! So we went for it! Jo from White Rose Cake Design near Holmfirth made us a beautiful four tier sponge cake – lemon, chocolate orange, salted caramel and carrot cake – covered in white chocolate ganache. Also, my friend Stephen from George & Joseph cheesemongers in Chapel Allerton made us a wonderful cheese wedding cake. We had vegan and gluten intolerant guests, so we also had a small Oreo cake made by Wildcraft Bakery. We had a week’s mini-moon straight after the wedding at a cottage in Craster, Northumberland – with Harvey the Border Collie. In June we will go to the Seychelles for the real honeymoon. However, we were so lucky to find Matt Sim who stepped in and took the most amazing photographs. The man is an artist! And I think it must have been fate that we got him. I don’t think Paul was very happy about the pink shirt and tie (to match the colour theme) – we may not see them again . . . . But he wore a very nice blue suit from Moss Bros. 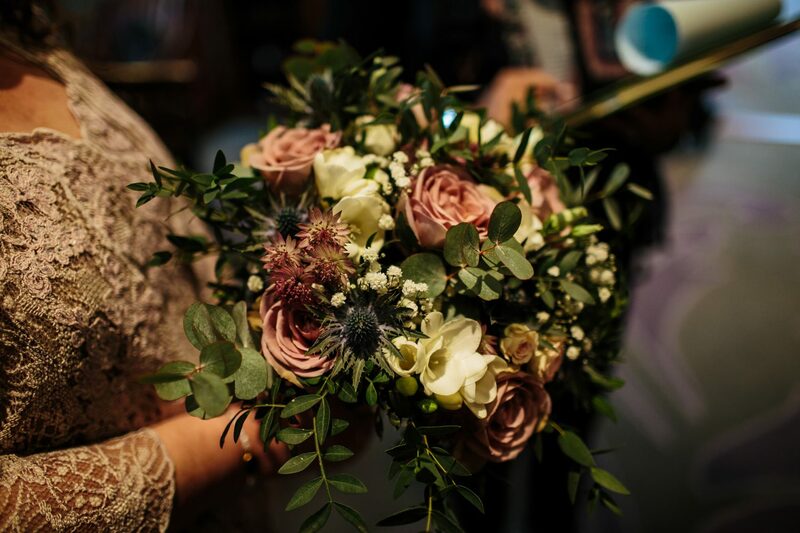 The flowers were based on a colour theme of dusky pink roses and blue thistles with lots of greenery – and I thought they were beautiful. They were created by Natasha Coustol Floral Designs. 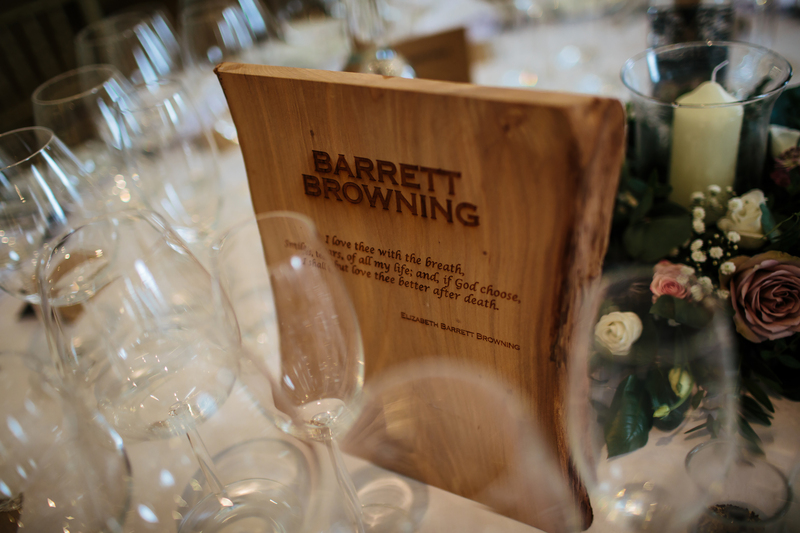 I am a literature graduate, so wanted my favourite authors/poets to feature in the wedding theme – so created rustic wooden table markers with author names for each table and quotes from my favourite poems. 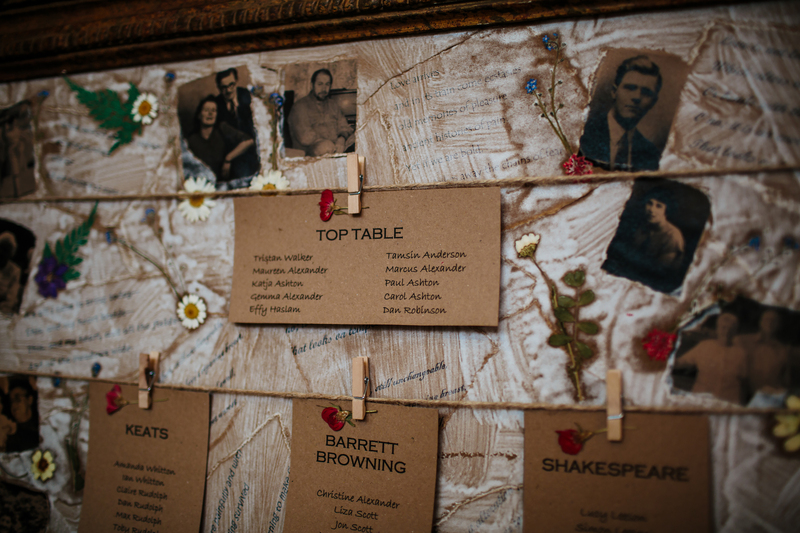 For the seating plan, my brother found an old plaster frame and we created a collage with snippets of the poems, little photos of people who we would have wanted there but are no longer with us and dried flowers. All of the food was amazing – all of our guests commented on this. We had canapes with the drinks reception (Mini Yorkshire Pudding with creamed horseradish, Onion Bhaji and cucumber & mint raita and Filo Wrapped King Prawns marinated in ginger & chilli and sweet chilli dip). 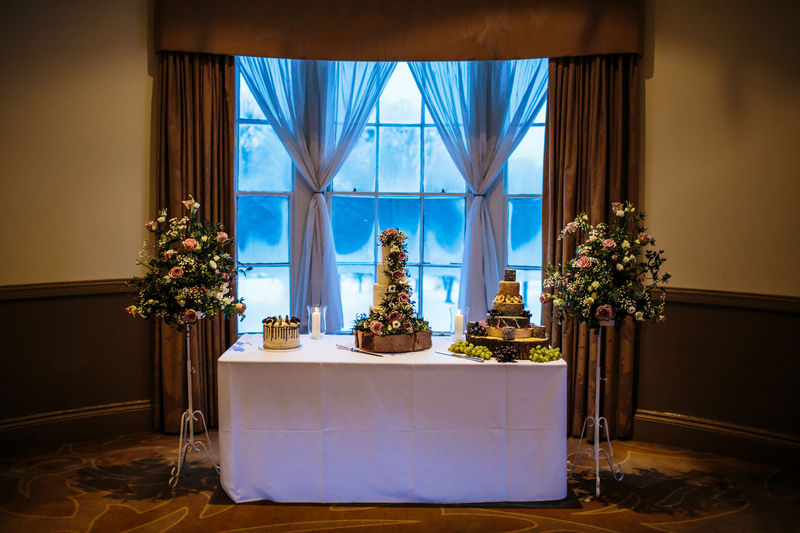 For the wedding breakfast we had Salad of Oak Roasted Smoked Salmon starter, Classic ‘Lemon Salt Roasted’ Chicken main course and Blueberry & Vanilla Cheesecake desert – with specially designed menus for the vegan, vegetarian and gluten intolerant guests. Later in the evening the team set out our wedding sponge cake and the “cheese” cake (with biscuits and chutneys) and served bacon or sausage butties and roasted vegetable paninis. 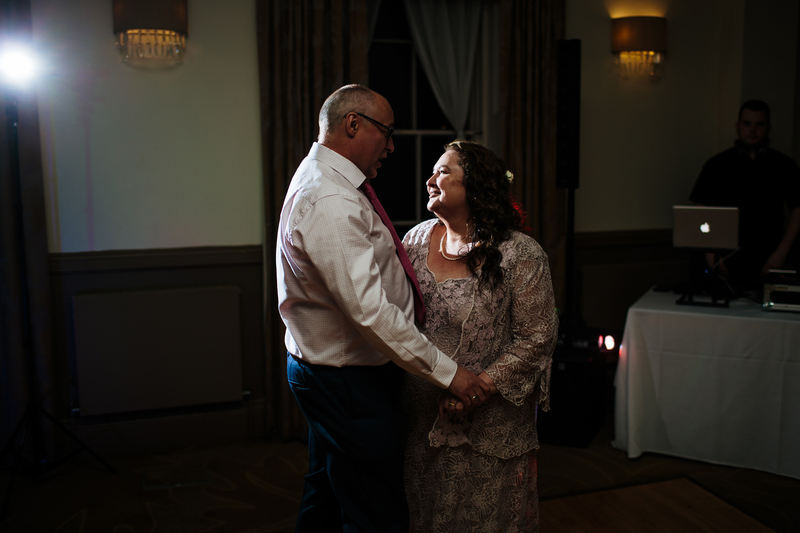 Our hair and make-up lady, Louise Rothwell (tmlouroth@gmail.com), was brilliant, totally un-flappable, great fun and did not let a little bit of snow stop her from getting over from near Manchester. The last thing I wanted was to arrive in a “big car” with everyone gawping at me! 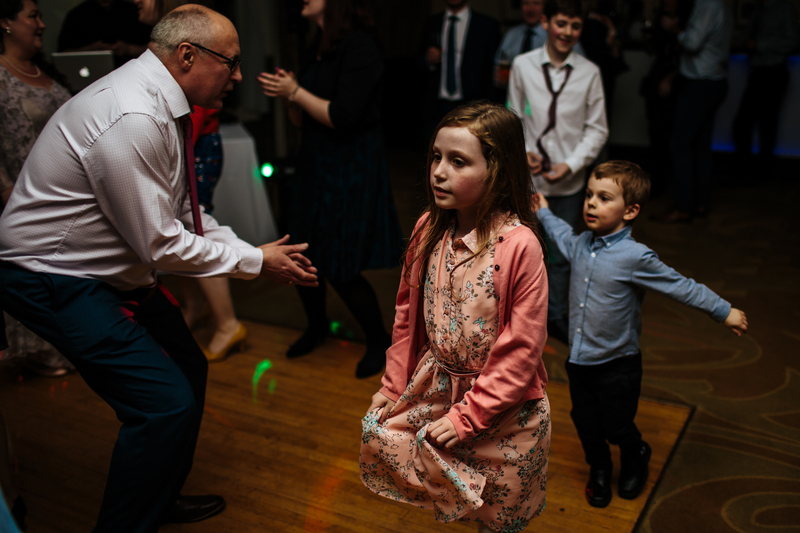 Slipping in at the back was my preferred mode of transport – and The Mansion allowed me to do this, as I got ready in the rooms upstairs and came down when everyone was already in their seats. Paul did threaten to arrive on the Roundhay Park Land Train – but luckily it was not running that day because of the snow! 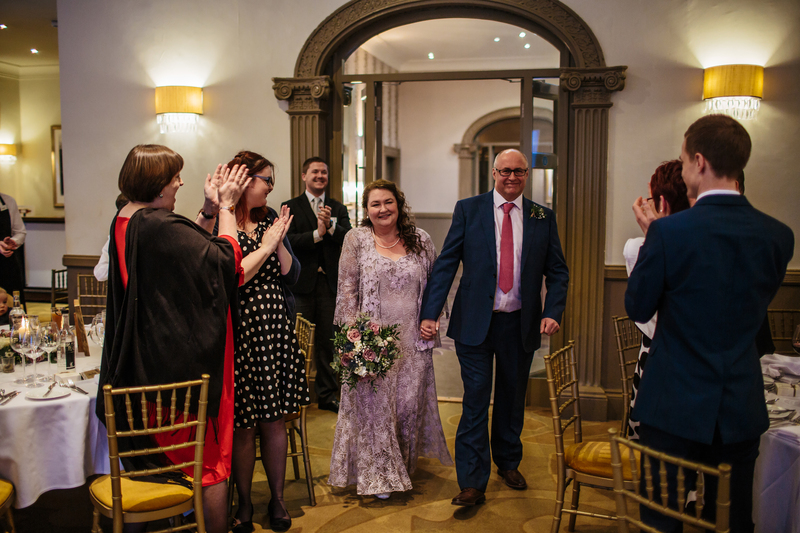 We had the ceremony in the beautiful Colonnades Room on the ground floor, followed by the drinks reception in the spacious hall way and Colonnades Room. The wedding breakfast and evening party was in the Mansion Room on the first floor. 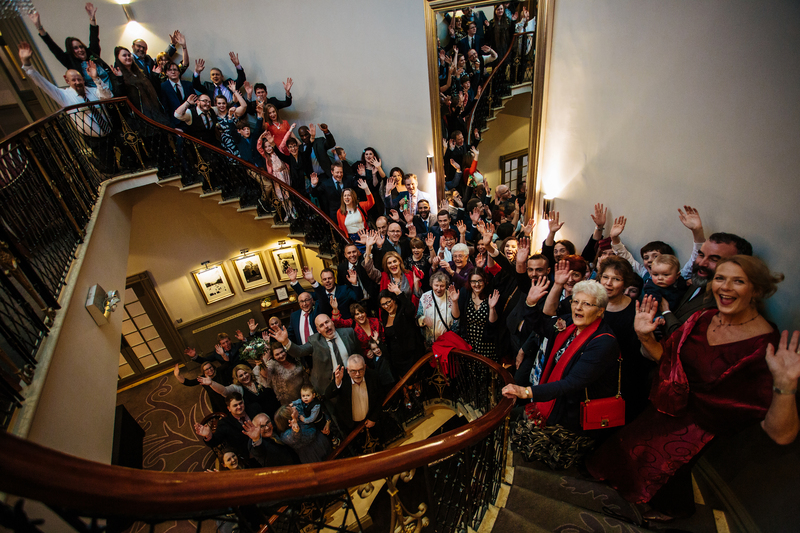 The stairs make a wonderful backdrop for group photographs – especially if you can’t head outside because of the snow! For the ceremony and the drinks reception we had talented harpist Anna Christensen (harpgear@gmail.com) – I loved walking down the isle to “Clair de Lune” one of my favourite Debussy pieces – and almost got distracted signing the register as I was listening to her play the slow movement from “Concierto de Aranjuez” by Rodrigo. Our evening band was local group Alex Graham and the Concords (agconcords@gmail.com). Alex is one the most talented pianists I have ever seen (watch their YouTube videos) and they had our guests on their feet and grooving. They also learned “Blueberry Hill” especially to play to Paul, who loves that song. What was the most memorable part of your day? I think it has to be saying our vows. I was so happy to finally be marrying the man I have always loved. But my sister’s best man speech comes in as a close second. Would you recommend Dine to friends and family? 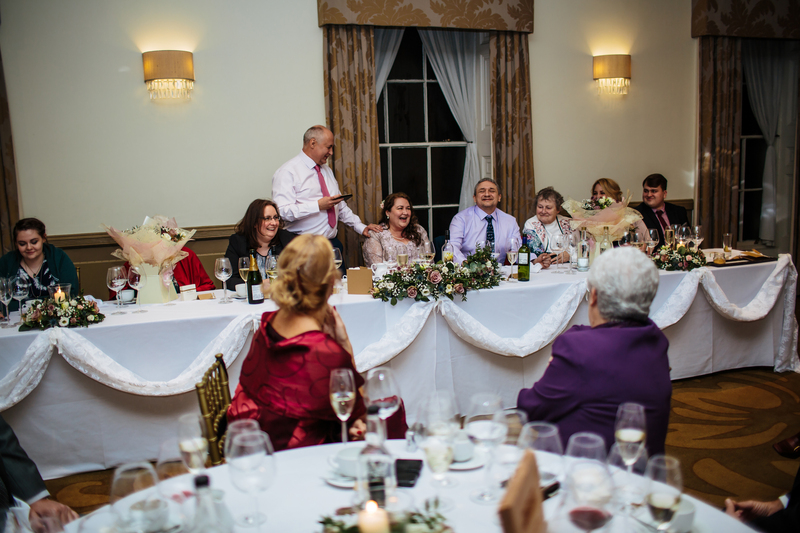 If you would like to enquire about holding your Wedding or Celebration at The Mansion, do get in touch, either on the phone, 0113 269 1000, or using our contact form.